2019.03.30 ‘Collision’ receives the 2019 CASETA Publication Award at the 17th Annual Texas Art Fair and Symposium on Early Texas Art at the TCEA Conference Center in Austin. 2019.03.01 ‘Collision’ receives the Ron Tyler Award for Best Illustrated Book on Texas History and Culture at the Texas State Historical Association annual conference at the Omni Hotel in Corpus Christi. 2018.12.16 Pete Gershon and Basilios Poulos in conversation at Deborah Colton Gallery in conjunction with Basilios Poulos: A Moment in Time (plus holiday pop-up book sale). 2018.11.07 Pete Gershon leads a tour of works from the Public Art of the University of Houston System, including sculptures and paintings by Salvatore Scarpitta, James Surls, Dorothy Hood, Jim Love, and George Bunker. 2018.11.01 Collision author Pete Gershon is the guest on Living Art, KPFT, 90.1 FM, at 6pm. This exhibition presents paintings, sculptures, and works on paper by Houston-based artist Sharon Kopriva, all relating to her life changing visit to the Nazca Desert in southern Peru in 1982. Kopriva is internationally known for her spiritual and darkly mysterious sculptural work--mummy-like figures which deliver a biting and frequently macabre critique of Catholic righteousness. Information supplied by the natural landscapes of Peru, Australia, and Hope, Idaho has also been central to her practice. This selection of rarely-seen, foundational early work is supplemented by archival materials that help to tell the story of Kopriva’s Peruvian epiphany. Organized by Pete Gershon. 2018.10.06, 5-7pm: Opening reception. Peruvian Pisco will be provided by Hacienda La Caravedo, In 2010, the Kallop Family of Houston purchased the oldest continuously operating distillery in the Americas, established in 1684. The Caravedo brand is the most award-winning Pisco and is considered the finest expression of estate produced, hand-crafted Pisco coming out of Peru. 2018.10.09, 7pm: Discussion with exhibition organizer Pete Gershon and artist Sharon Kopriva about the work in the show. Featuring rare and unusual ephemera from the collection of the Hirsch Library including materials published by the B&E Holding Firm, H.J. Bott, Lawndale Annex, Louisiana Gallery, Midtown Art Center, Moody Gallery, Robinson Galleries, Studio One Alternative Space, Texas Gallery, and the Archives of American Art. 2018.09.04 'Collision: The Contemporary Art Scene in Houston, 1972-1985': Sneak peek and gallery tour at the Glassell School of Art, Houston, TX. Presented by Visual Arts Alliance. Overview of the research behind 'Collision: the Contemporary Art Scene in Houston, 1972-1985.' Free and open to the public. This talk is sponsored by the University of Houston Program in Art History. Join Lawndale along with artist Meredith "Butch" Jack and Pete Gershon, Lawndale programming committee chair, in conversation about sculpture, Houston's art scene, and communication in all its forms. Presented in conjunction with the exhibition Meredith Jack: Playing in the Sandbox, Too, on view November 13, 2017 - January 7, 2018. This event is free and open to the public. Beverages provided by Saint Arnold Brewing Company. Brochure for Playing in the Sandbox, Too with Pete Gershon's essay. Reading and ‘friend-raiser’ for Collision project presented in conjunction with James Surls’ Thought Wave - Drawings from Matter and Mind, on view March 25 - September 3, 2017. Discussion organized in conjunction with Mydolls record-release performance at the third installment of SPEAKEASY, a new program featuring music, performance, and discussions of contemporary art that takes its cue from the eponymously titled series presented at Lawndale from 1993-2002. Speakers: Pete Gershon, SPEAKEASY co-curator and Lawndale Art Center programming committee chair [moderator]; Mary Ross Taylor, former director of Lawndale Art Center; and Mydolls: Trish Herrera, Linda Younger, Dianna Ray, George Reyes. Video by Cressandra Thibodeaux. 2017.02.02 “Gallery Talk: Bert L. Long, Jr.: Looking for the Right Time” Deborah Colton Gallery, Houston, TX. This gallery walk-through with exhibition curator Pete Gershon places the work of Houston artist Bert L. Long, Jr. in a historical context. Deborah Colton Gallery artist Jonathan Paul Jackson also shares his perspective as an artist influenced by Long’s artwork and legacy. Deborah Colton Gallery presents Looking for the Right Time, a solo exhibition of the works of Bert L. Long, Jr. (1940-2013), one of the most talented, versatile, and prolific artists ever to hail from the state of Texas. With his paintings, sculptures, drawings, prints, and photographs, he sought above all else to communicate with the viewer. Curated by Pete Gershon. Four projects in the works aim to rescue Houston’s significant art history from the sands of time. Panelists Theresa Escobedo, Director, Houston Foundations’ Focus: Suzanne Paul project; Pete Gershon, Core Residency Program Coordinator at Glassell School of Art, Museum of Fine Arts, Houston; Patricia Hernandez, Founding Director, Studio One Archive Resource, Patricia Johnson, independent scholar, author, and Pulitzer-nominated former Houston Chronicle art critic, and Chelby King, independent scholar and past Lawndale Art Center Director, speak about archives and volumes in the works respectively on photographer Suzanne Paul, “Collision: Contemporary Artists in Houston 1972-1985,” the Studio One Archive Resource initiative, and the CAMH’s seminal museum director and mentor to the de Menils, Jermayne MacAgy. Moderated by Catherine D. Anspon, Executive Editor, PaperCity. Artist Caroline Wright writes about channeling the fictional Morris Blodgett. 2016.09.10 Artist Talk led by Rino Pizzi with artists and writers from the exhibition ArtFiction: Ten Fictional Modernists from Texas, Lawndale Art Center, Houston. Susanne Theis, programming director of Discovery Green, moderates a panel on the intersections of art and community with Smither Park designer Dan Phillips, author Pete Gershon, and curator William Fagaly. Co-presented with the Orange Show Center for Visionary Art. Independent filmmaker Ken Harrison provides a look into the contemporary Texas art world of the mid-1970s. Jackelope is loosely divided into three segments focusing on three young artists: James Surls, George Green, and Bob Wade. This fascinating time capsule captures each artist in casual moments, sharing ideas about art, the artistic process, and life in Texas. Jackelope also includes appearances by fellow Texas artists John Alexander, Mel Casas, Letitia Eldredge, and Mike McNamara. Unseen for many years, Jackelope is presented in a new digital restoration. Author Pete Gershon reads excerpts from his [since retitled] work-in-progress. ArtFiction is a new project by Rino Pizzi, in collaboration with ten writers, ten visual artists, and ten actors/performers. The group is developing ten fictional modernist visual artists and performers working in Texas between the 1940s and the 1980s. This event will be the first announcement of the upcoming exhibition, and will present previews of articles, biographies, and reviews created by the writers, as well as images of artwork and photographs. The exhibition will be accompanied by a book/catalogue designed by DJ Stout/Pentagram. Participants include writers Stephen Harrigan, Robert Faires, Kurt Heinzelman, Janis Bergman-Carton, Kirk Lynn, Mary Mikel Stump, Katie Robinson Edwards, Edward Carey, Saundra Goldman, and Pete Gershon; visual artists Liz Ward, Jana Swec, Sydney Yeager, Jules Buck Jones, Caroline Wright, Rick Mansfield, Stella Alesi, and Steve Wiman; performance artist Amy Diane Morrow; actors Jason Phelps, Nadine Mozon, Jeff Mills, Cami Alys, W. Tucker, Florinda Bryant, Billy Ray Mangham, Jennifer Balkan, and Teresa Elliott; and photographers Bret Brookshire, Leon Alesi, and Rino Pizzi. Most participants will be in attendance. Presented in conjunction with Collective Solid, (on view July 18 through August 22, 2015) this panel discussion, co-moderated by Pete Gershon and Christine Jelson West, highlights the artists' perspective on their work, their creative spaces, and their role in the Houston Art community. Participating Artists: Darwin Arevalo, Dylan Conner, Jonathan Paul Jackson, Alex Larsen, Patrick Renner, David Salinas. 2015.06.03 “In Dreams, Visions: Eight Visionary Artists from Houston” C.G. Jung Educational Center, Houston, TX. This discussion is presented in conjunction with In Dreams, Visions, an exhibition showcasing the work of eight visionary artists from Houston and the Texas gulf coast, a few of them conventionally trained, but most entirely self-taught. What they have in common is that they have used images from their dreams and visions as source material for their paintings, drawings, and sculpture. From spiritual rapture to existential torment, from wonder to despair, these artists have revealed their inner psychological landscapes in a way that may help us all to better contemplate and understand our own humanity. Speakers: Pete Gershon, curator of the exhibition and author of Painting the Town Orange: The Stories Behind Houston’s Visionary Art Environments [moderator]; Kate Burns, Jungian analyst; Alison de Lima Greene, Curator of Contemporary Art and Special Projects at Museum of Fine Arts, Houston. This exhibition showcases the work of eight visionary artists from Houston and the Texas gulf coast, some conventionally trained, others entirely self-taught. What they have in common is their use of images from their dreams and visions as source material for their paintings, drawings, and sculpture. From spiritual rapture to existential torment, from wonder to despair, these artists have revealed their inner psychological landscapes in a way that may help us all to better contemplate and understand our own humanity. Featuring the work of John Atlas, Henry Ray Clark, Frank Jones, Bert L. Long, Jr., Jesse Lott, James Reaben, Earl Staley, Dee Wolff. Organized by Pete Gershon with assistance from Jay Wehnert, Jack Massing, Dee Wolff, Jesse Lott, John Atlas, Earl Staley, Gail Reaben, Manny Sanchez, and the estate of Bert L. Long, Jr.
2015.05.17 “Pow Wow: Contemporary Artists Working in Houston, 1972-1985” The Frank and Eleanor Freed Auditorium at the Glassell School of Art, Houston, TX. Pete Gershon, author of Painting the Town Orange: The Stories Behind Houston’s Visionary Art Environments (History Press, 2014) hosts this presentation and panel discussion based upon his work-in-progress Pow Wow: Contemporary Artists Working in Houston, 1972-1985. In it, he draws upon primary archival materials, contemporary newspaper and magazine accounts, and extensive interviews with dozens of significant figures to present a creative non-fiction narrative that preserves and interweaves the stories and insights of the artists, collectors, patrons, and administrators who transformed the city’s art scene. What were the highlights, the detours, the noble failures? How did the city influence these local artists, and how did they in turn influence life in the city? How did contemporary art activity in Houston reflect, oppose, or presage trends in the regional and national arts community? Was there really any such thing as a "Houston School," and if so, what was it? This project is funded in part by a grant from the City of Houston through Houston Arts Alliance. Speakers: Pete Gershon [moderator]; arts patron Marilyn Oshman and artists Richard Stout, Lynn Randolph, Earl Staley, and Kelly Alison. 2015.03.21 “Telling Stories: Regional Artists and Their Art”. ARLIS/NA 43rd Annual Conference, Omni Hotel, Fort Worth, TX. “Life is short, but art endures,” wrote Hippocrates. Indeed, art objects are likely to survive across generations, but the life stories of their makers, especially those of obscure regional artists, are far more ephemeral and too often lost to time. Fortunately, there are intrepid art historians, journalists, and researchers who seek to capture this information and preserve it for posterity. How do they organize their projects? How do they choose their subjects? What facts are gathered, and how is this information recorded, stored, and disseminated? This panel of three researchers will answer these questions as they discuss their experiences in documenting the work of regional artists. Speakers: Pete Gershon, Program Coordinator, Core Residency Program, Glassell School of Art, Museum of Fine Arts, Houston and author of Painting the Town Orange: The Stories Behind Houston’s Visionary Art Environments [moderator]; Craig Bunch, Assistant Librarian, McNay Art Museum and author of Collage and Assemblage in Texas: The Interviews; Jennifer Shaykett, Librarian, American Craft Council. Pete Gershon will read from his book 'Painting the Town Orange: The Stories Behind Houston's Visionary Art Environments,' an exploration of the biographies, techniques, and motivations of the creators of our city's handmade cultural landmarks, including the Orange Show, the Beer Can House, and the Flower Man's House. This event focuses on the incredible story of Cleveland Turner, the Third Ward's ubiquitous "Flower Man." Join author and Core Program coordinator Pete Gershon for a reading from his new book, Painting the Town Orange: The Stories behind Houston's Visionary Art Environments. The reading is followed by a screening of Laurie McDonald's 2000 documentary Eyeopeners, an exploration of seven visionary-art environments around Houston. Free & open to the public! Judges: Bill Arning, director of the Contemporary Arts Museum Houston; Pete Gershon, author of Painting the Town Orange: the Stories Behind Houston's Visionary Art Environments; Raphael Rubinstein, Professor of Critical Studies at the University of Houston; with Ann Harithas, Will Robinson, and Marilyn Oshman. Presented by the Orange Show Center for Visionary Art. set against the backdrop of the city’s quirky history. 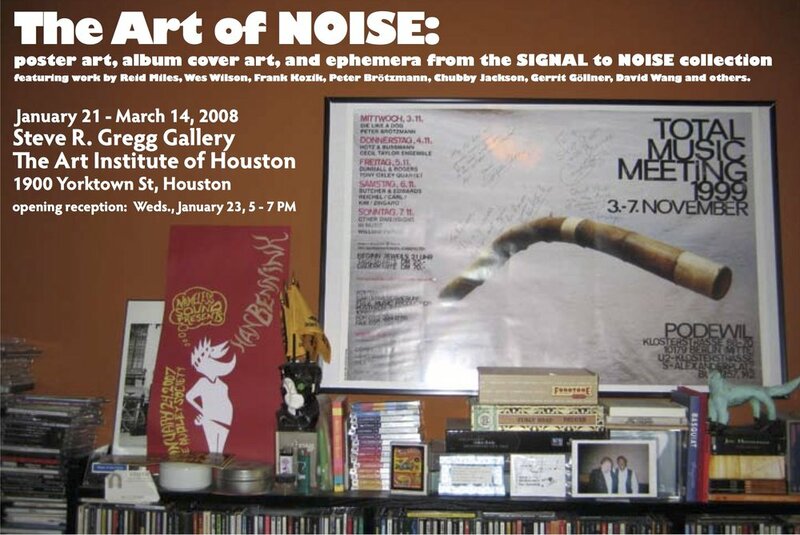 The Art of Noise presents poster art, album cover art, and small works on paper from the collection of SIgnal to Noise editor Pete Gershon, including works by Peter Brotzmann, John Burpee, Gerritt Gollner, Frank Kozik, Chubby Jackson, Olivia Tremor Control, David Wang, Wes Wilson, and others. Trumpeter Raphe Malik, journalist Bob Blumenthal, Signal to Noise publisher Pete Gershon, poet David Budbill, and Boxholder Records' Lew Kannenstine talk about the state of creative jazz in conjunction with the Discover Jazz Festival.